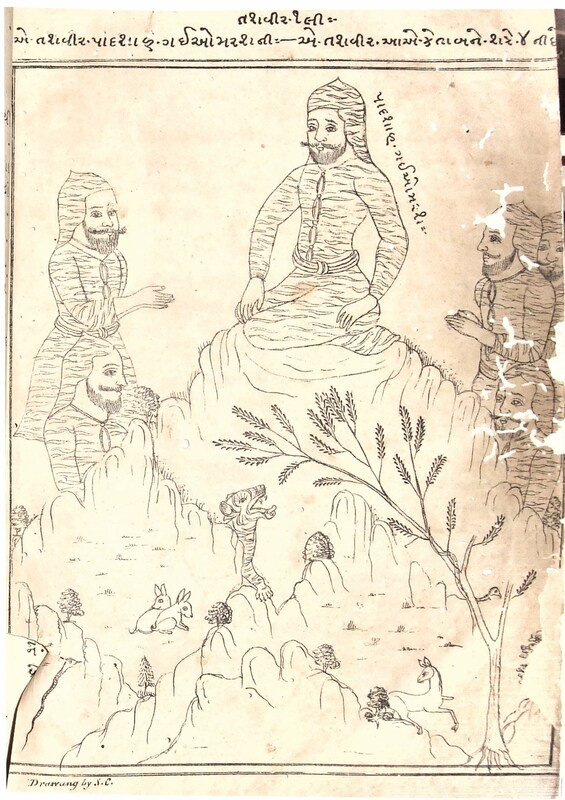 In the latter part of my recently published article, "Picturing Prophethood: The K. R. Cama Oriental Institute Zarātushtnāma Manuscript HP 149 and the Origins of Portraits of the Prophet Zarathushtra," I discuss the establishment of lithographic printing (chāp-i sangī) presses in the city of Bombay during the first half of the nineteenth century. Recently, there has been great interest among art historians in the history of illustrated lithographs, especially those in Persian and Urdu, and above all, the Shāhnāma, the Persian Book of Kings. Ulrich Marzolph's Narrative Illustration in Persian Lithographed Books (2001) and his آلبوم شاهنامه:‌ تصویرهای جاپ سنگی شاهنامۀ فردوسی (with Mohammad Hadi Mohammadi, 2006) have made hundreds of beautiful nineteenth-century lithographed miniatures available to modern audiences, and have blazed a trail in illuminating the unstudied world of the nineteenth-century book illustrator. Yet the early history of the lithographed miniature remains very much an open question. Some years ago, while I was browsing the shelves in the "Special Collections" room of Bombay's New and Secondhand Bookstore in Dhobi Talao, I came across a Gujarati translation of the Shamshīrkhānī abridgment of the Shāhnāma entitled the Rostamnāmũ (The Book of Rustam), translated by the famous Fardunji Marzbānji, the first Parsi proprietor of a printing press in Bombay and the founder of the Muṃbai Samāchar newspaper. This Rostamnāmũ was typeset and printed on Marzbanji's Daftar Āśkārā press in 1843. The text was named in honor of Śeṭh Rustamji Kāvasji Banāji of Calcutta (1792 – 1852), an opium merchant, banker, and ship-builder, and one of the leading philanthropists of the Kadmi Zoroastrian community. As I leafed through the book, I was surprised to see that it contained 26 lithographic illustrations, drawn by a (presumably Hindu) artist named "S. Cassinathsett". While the images lack the elaborate detail of later lithographic illustration, the text is remarkable as the oldest printed Shāhnāma with illustrations. For that matter, these might well be the oldest lithographed miniatures anywhere in the Persian-speaking world (Marzolph lists a certain Laylī va Majnūn of Maktabī, also printed in 1843, with four lithographed illustrations, which I have been unable to locate). While it might be surprising that the oldest Shāhnāma lithographed images should occur in a Gujarati, rather than a Persian, recension of the text, it should be noted that the Daftar Āśkārā press was also a prolific publisher of Persian texts in mid-century Bombay. Lithography was already being used for Persian printing in Bombay by 1826, with the publication of the شواهد النفیسه فی الاثبات الکبیسه by Ḥājī Muḥammad al-Iṣfahānī, a work published during the heyday of the Parsi calendar wars. While printers experimented with lithographing Gujarati between the 1820s-1840s, by the mid-1840s, Gujarati was routinely typeset while Persian was typically lithographed. It is quite possible that printers at presses like Daftar Āśkārā also found work at other printing houses in Bombay and brought knowledge of lithographic illustration with them, which very quickly began to be applied to Persian texts. Three illustrated Persian Shāhnāmas printed through the lithographic process appeared in Bombay between 1846 and 1856, and lithographic illustration rapidly spread across the Persian printing presses of the subcontinent, where it were exported to Iran and elsewhere. Since the text of Rostamnāmũ is so rare and to my knowledge has not yet been noted in scholarship, I thought that it would be useful to post images from the text here. Two illustrations (# 16 and # 21) are missing from my book, while illustration # 22 has been included twice. While most of the illustrations are printed on single sheets of paper, some are tipped in and folded, while others are printed over two bound sheets. Unlike later Persian lithographed illustration, the miniature never occurs on the same page as the text, presumably because the text pages are typeset. In any case, I hope that you enjoy this treasure of early Shāhnāma printing as much as I do! 1. The Court of Gayomars. 12. Sohrāb and Rostam, First Bout. 13. Sohrāb and Rostam, Second Bout.